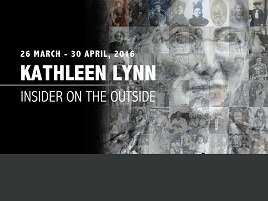 Kathleen Lynn: Insider on the Outside is a creative investigation into the life and work of Kathleen Lynn by thirteen contemporary Irish artists. The exhibition is curated by Catherine Marshall and spreads across five publicly-funded visual-arts spaces in Mayo. Born into an Anglo-Irish family in Mullafaghry, Killala in 1874, Kathleen Lynn went on to play a significant role in the 1916 Easter Rising. A medical doctor, active suffragette, labour activist and nationalist, Lynn was a member of the "Irish Citizen Army" and its Chief Medical Officer during the Rising. For her part in the Rising she was imprisoned in Kilmainham Gaol, with Constance Markievicz, Helena Molony and her lifelong companion Madeleine ffrench-Mullen. During the 1920s she was best known for her pioneering work with Dublin's poor at Saint Ultan's Hospital for Sick Infants, which she established in 1919, with a group of female activists including Madeleine ffrench-Mullen. This work engaged her for the rest of her life. Lynn died on 14 September 1955, and was buried in the family plot at Deansgrange Cemetery with full Military Honours. The Mayo Arts Collaborative recognizes 2016, the Commemorative Centenary Year, as an opportunity to re-focus national attention on this extraordinary Mayo woman, by championing her in the county of her birth. The project creates a cultural trail through Mayo and both visitors and locals alike are encouraged to engage with Lynn's life and work through the exhibition in Belmullet, Ballycastle, Ballina, Castlebar and Westport.